Whereas some are much longer and more detailed i.e. “5- Duties of Client” taking up about 2½ A4 sized pages and also “7-Duties of principal contractor and contractor” – this covers just less than 3½ pages. Also in this category are “13-Excavation” and “14-Demolition” (2½ pages each) however- Regulation 17- “Suspended platforms”stands head and shoulders above all the rest taking up almost 4½ pages and yet, we find that it is the most misunderstood of all. It covers inter alia, supervision and the necessary appointments, professional engineering / designer requirements, preparation and submission of operational documentation, quality and strength of materials being used, reaction forces and load implications for the structure on which these are to be used, PPE matters, safe working loads (rated loads, total mass loads) and markings, inspections, performance tests and even training requirements for the users of these platforms. There is nothing vague nor ambiguous contained in Regulation 17. The most probable cause for it being misquoted / misunderstood is due to the technical nature of the products that it covers. These units require significant electro-mechanical, structural and rigging knowledge and expertise. This expertise requirement is confirmed by the fact that there are 4 SABS safety standards directly created for this equipment. Two of these standards namely SANS10295 -1 and SANS10295-2 are currently subject to a review process to bring them in-line with current safety philosophies. The other two are due for revision within the near future, again due to their age: - circa 2000. Albeit dated, these standards (SANS51808 and SANS1903) are still applicable. ·Hoists– these can be either electrically powered or manually powered but must be purpose-built for “man-riding equipment” – i.e. you cannot use chain blocks. Rope & tackle or industrial hauling machines (wire rope pullers) or material hoists. The hoist is fitted with an integral brake that is designed to stop and hold the full load under normal operation conditions. These brakes will also activate under a “no-power” condition. The design of the hoists is such that under a “no-power” condition the platform can be lowered manually by pulling on the brake release lever. The machine will lower the platform at a controlled speed quite safely. pictorial operating instructions must be supplied with each platform. ·Overload detection devices.These devices measure the loads in the hoist ropes and will activate in the event of an overload. When activated, the hoist to which the device is attached will stop operating, thus preventing it from trying to lift a load greater than what the system is designed to lift safely. Obviously, such devices are not fitted to manually powered winches. On some machines, the load sensing device is built into the enclosure of the hoist and on others the device is mounted below the hoist however - on all electrically powered platforms these devices are mandatory. Rated load plate.This plate is normally fixed to the kickboard and must show the number of persons plus equipment / materials that can be carried and must also show the maximum mass load aka “Rated Load”. The supplier’s name and contact number should also be clearly displayed.Note - If the platform is rated for three operators then there must be at least three PPE anchor points identified on the platform. The steel wire ropes of Temporary Suspended Platforms must be rigged onto overhead supports. 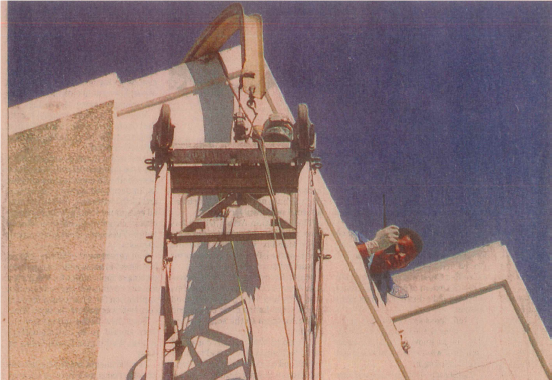 There are a variety of standard “roof rigs” in use such as parapet clamps, davit arms, monorails and suspension beams. The suspension beams are the most common of all the roof rig systems and used in about 80% of all installations. The horizontal outrigger should be designed to withstand the induced bending moments and be torsionally rigid. Square hollow sections are much stiffer than channel sections. Channel beams are not resistant to torsional loading (twisting) and should not be used in such applications. An overloaded channel section could twist through 90 degrees and then bend over completely due to the forces acting through its weakest section. See the enclosed photograph showing how the channel outrigger had twisted and then bent, causing the platform to collapse down the side of the building. Any and all outriggers must carry an engineer’s design certificate indicating the maximum cantilever length that it is designed to operate at and also showing the maximum point load on its end. 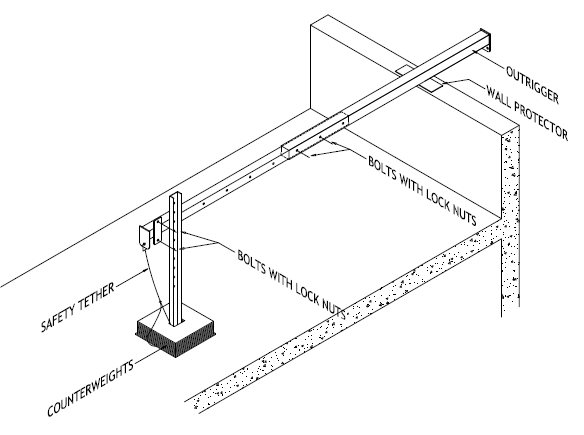 Note that the point load is the working load limit of the hoist and not the safe working (rated load) on the platform. However, the design load used by the design engineer is much higher to allow for impact loadings and factors of safety. 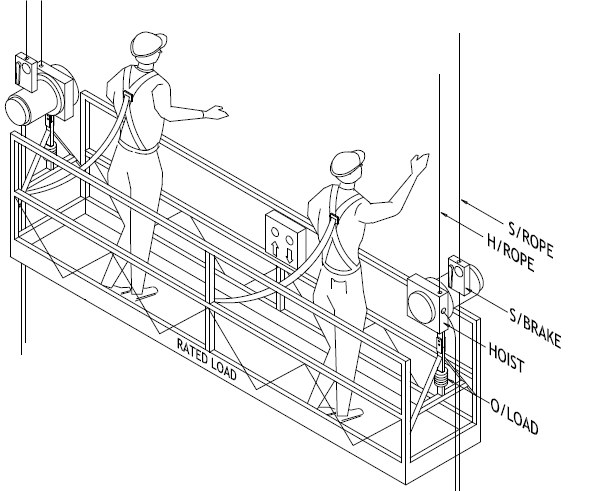 SANS51808 Section 6.5.3.5 defines that design load as being at least three times (300%) the working load limit of the hoist. (a) The system must be designed in accordance with SANS51808, and SANS1903. Proof of competency of erectors and users. Training of users must comply at least with sub-section 12 of regulation 17. Line sketches of the complete system showing the rated load on the platform. Twisted and bent channel outrigger caused platform to collapse. Temporary suspended platform supervisors are declared competent after completing training against Unit Standard 243271. This is set at NQF level 4 with 8 credits. The IWH Professional Body issues the professional designation for this supervisor.